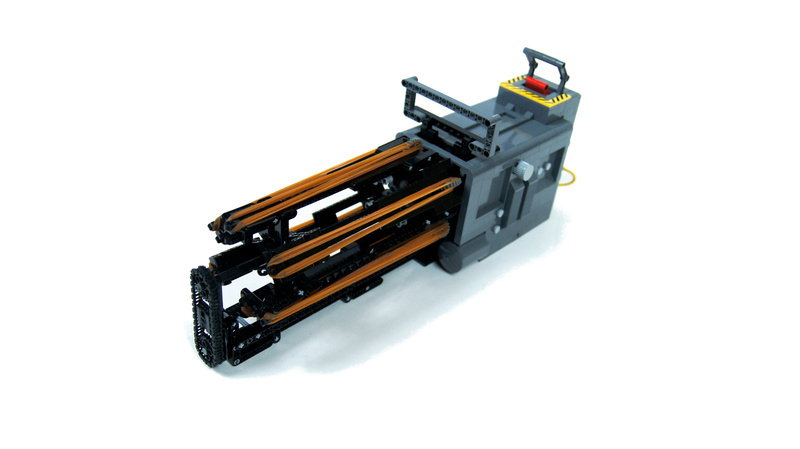 A 6-barrel motorized minigun capable of firing 11 rubber bands per second. The rubber band miniguns seem to be the thing recently, and I was interested in playing with one. 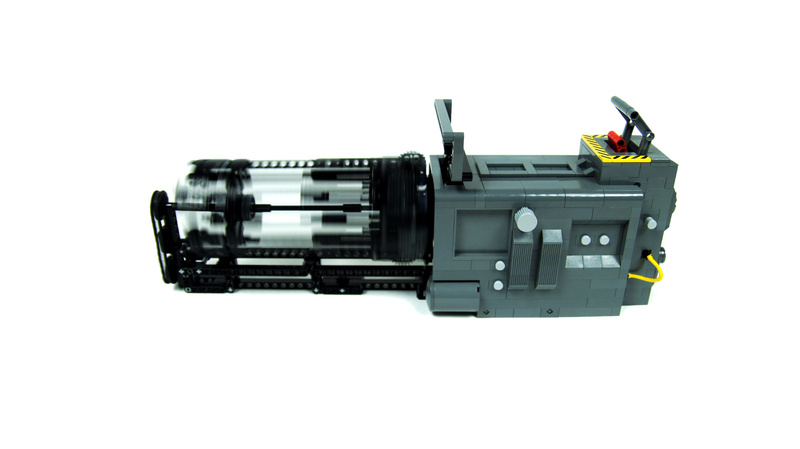 There was plenty of Lego miniguns, but the ones I’ve seen all seemed to use similar type of a trigger mechanism, which didn’t appeal to me. I decided to build one with my own trigger mechanism. 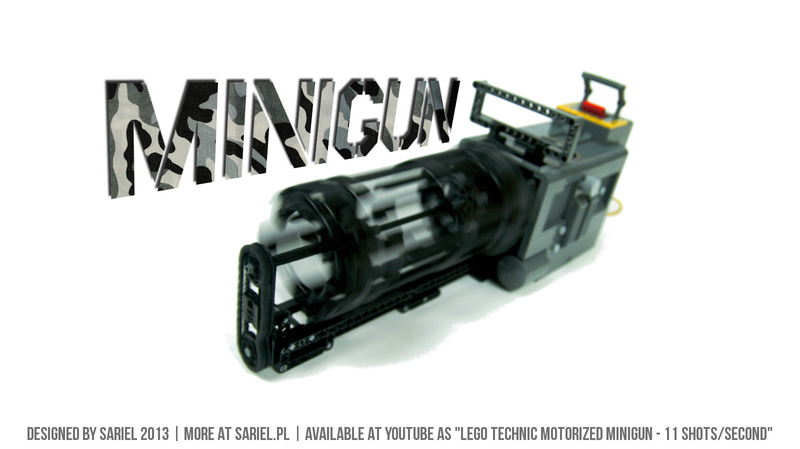 Just like the real thing, the minigun had six identical barrels. Three of these were offset by 1 stud to help to pack them more closely together. 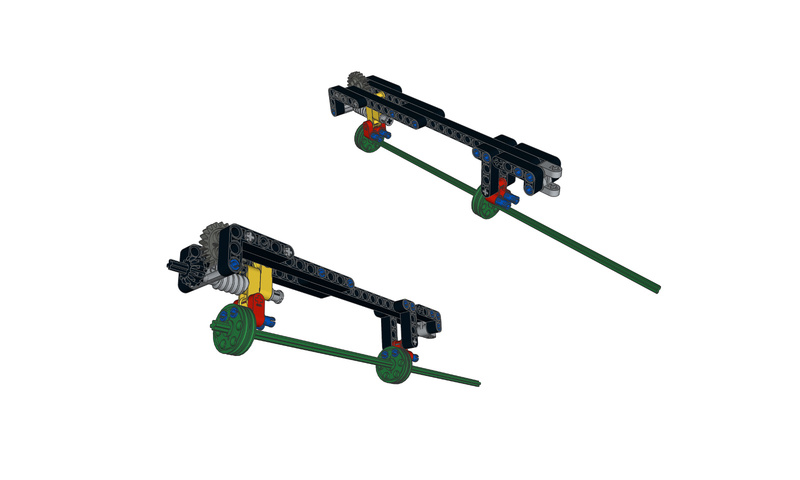 Each barrel could hold up to 11 rubber bands between the fork on its front and the 24t gear wheel at its back. The gear wheel was locked by a worm gear, which was sitting on an axle running along the barrel. That axle ended with another 12t gear wheel protruding out of the barrel’s back. Each time the barrels were rotated, the 12t gear wheel on each of them would come in contact with a 20t gear wheel fixed to the minigun’s body so that it couldn’t rotate. Thus, the barrels’ rotation was making the 12t gear wheels rotate in contact with the 20t gear wheel, which happened once per rotation. As they rotated, so did the worm gear in each axle, making the respective 24t gear wheel rotate as well. 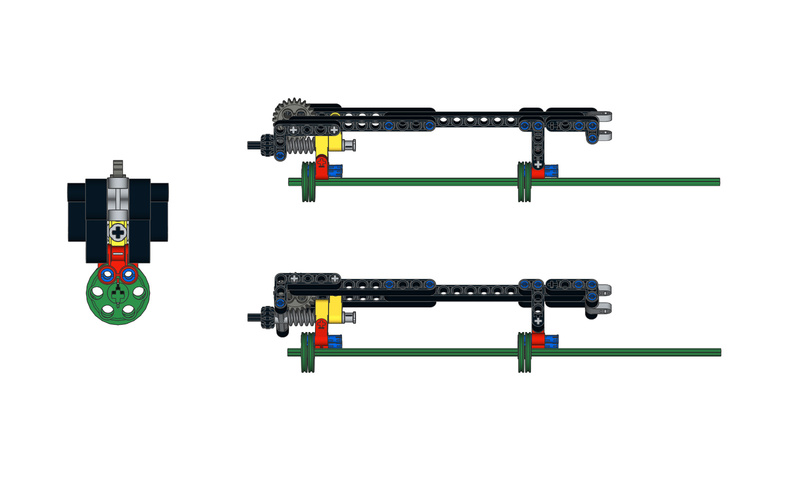 Thanks to the forward rotation, the 24t gear wheel would then release the rubber bands one by one. The main advantage of this trigger mechanism was that it was simple and safe – even very safe, since the gun was secured at all times, even during loading, and wouldn’t fire accidentally even if handled roughly. The disadvantage was that sometimes the 24t gear wheel’s rotation was insufficient and a barrel would miss one shoot until next rotation, and that there was no single specific point of the rotation at which the bands would be fired. That made the stream of rubber bands uneven and slightly scattered. 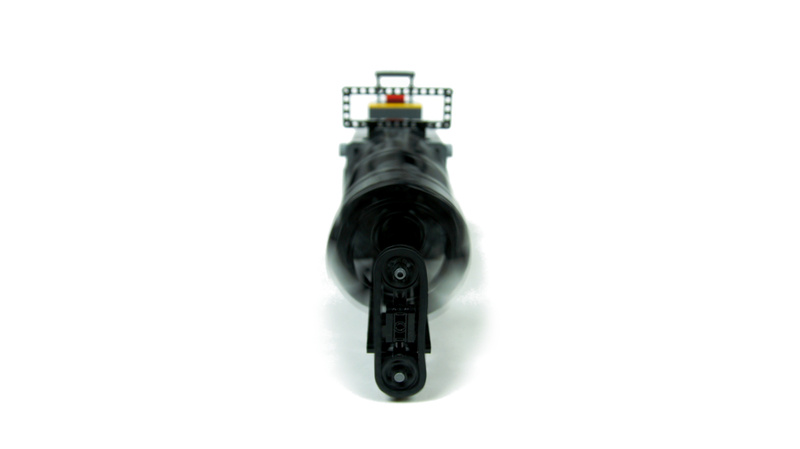 The trigger mechanism took some space at the back of the barrels, so they had to be driven from the front end. A single PF Medium motor was used for that, without any gear reduction. 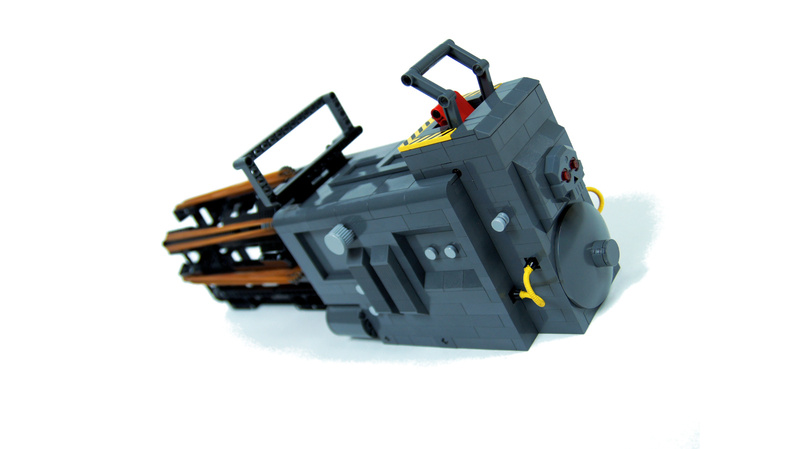 The motor was enclosed within the minigun’s body, as was the 8878 battery powering it. 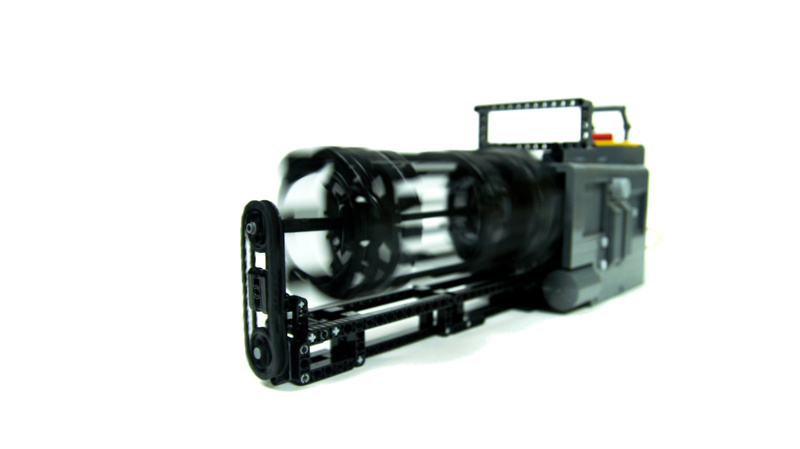 The battery’s on/off switch was engaged by the trigger at the minigun’s rear handle, and its speed dial was rotated by knobs on both sides of the minigun’s body. 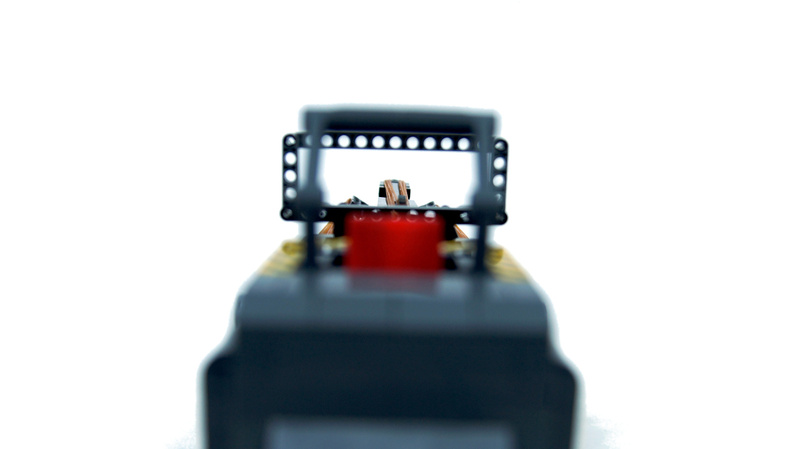 The knobs allowed to reduce the speed of the minigun’s rotation, or even to revert it, which was helpful while loading, since it would make the minigun pull the rubber bands “in”. The gun was extremely fun to play with, and it provided excellent range, surprisingly strong impact and decent accuracy. However, all of this was at the cost of plenty of time spent loading. I don’t use Rebrickable. 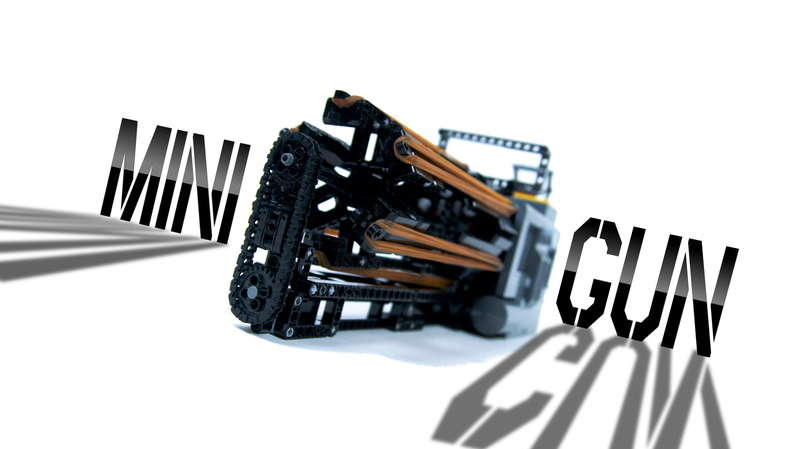 I’m sure you can find at Bricklink searching for “skull”. 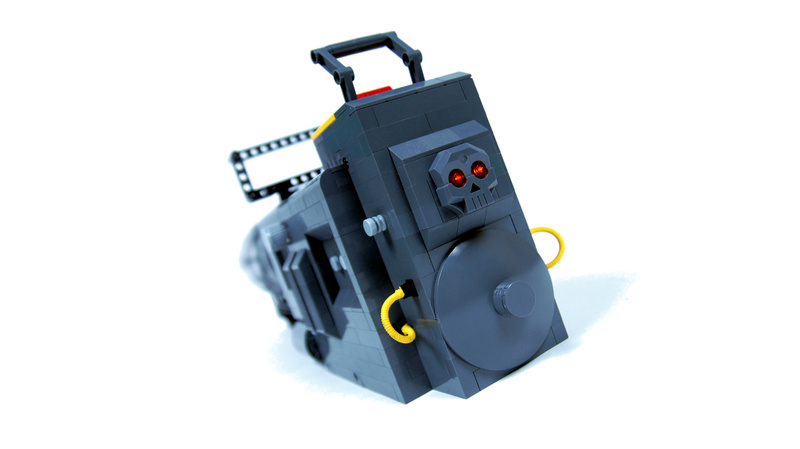 Can you give a Rebrickable link to the skull piece you used in the back of the minigun? Bonjour Sariel, je te suis sur toute tes vidéos et j’ aime l’idée du MINIGUN .Pourrais-tu pour une KALACHNIKOV et la posté sur Youtube .Merci!!!! No. I don’t use LDD anyway. Am I allowed to publicate the LXF file of your Minigun? Frankly, I’d rather stay out of it. It’s a nice, fun video, and you did credit me, but when you’re using someone else’s idea, there’s always the risk people may feel it’s not credited adequately. The way I see, it’s your risk. I see nothing wrong with using, modding and improving my original design, but how people feel about it is between them and you, I simply don’t want to be the judge here. Feel free to quite this comment, if this helps. Cool, talking about weapons it would be really cool if you made a iron man 3 suit from lego!!!! I am having similar problems to blobbydude; I cannot seem to attach the barrel around the firing mechanism because of the 20 tooth gear being in the way. If you could, could you please send me a photo of the firing mechanism if possible. Yes, I think I understand now. Thanks! There should be enough space between the 20t gear and the axle to support the axle. Perhaps you’re putting the 20t gear too close to it. I have been trying to build this, but I don’t understand how the barrel attaches to the main body of the gun. When I try to put in the 20t gear, it gets in the way of the center axle. If I remove part of the axle, it is only supported at the tip of the gun, and doesn’t work. Can you provide a picture or explanation? I like the clever rotating barrel concept. 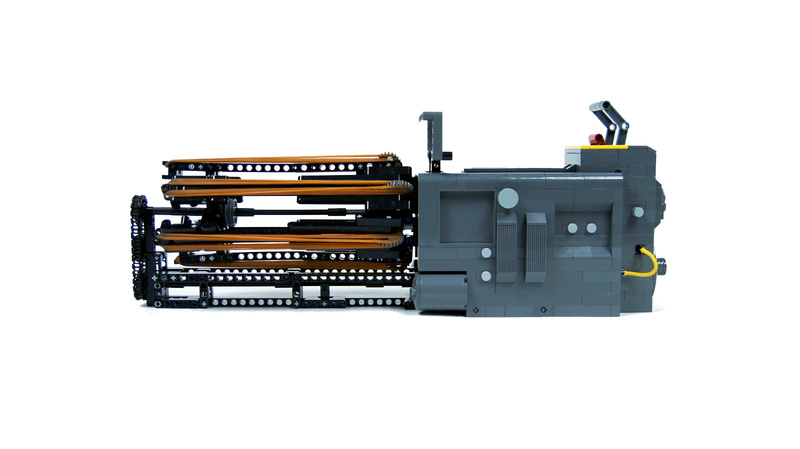 I wonder if it could be adapted to fire loads of Lego Competition Arrows ( http://www.bricklink.com/catalogList.asp?q=competition%20arrow )?